1 For GUAVA SAUCE, melt Country Crock® Spread in small saucepan over medium-high heat and cook onion and garlic 2 minutes. Add guava paste and prepared Knorr® Chicken flavor Bouillon and cook, stirring occasionally, until guava paste dissolves, about 7 minutes. Remove from heat; let cool slightly then puree in blender or food processor until smooth. 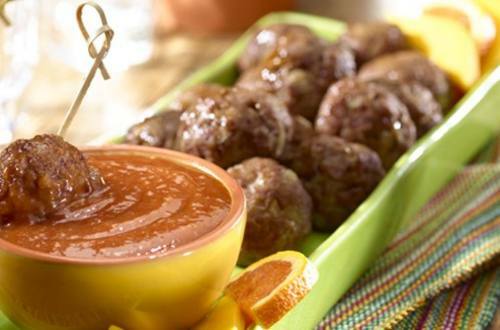 2 For MEATBALLS, combine all ingredients except olive oil in medium bowl and shape into 24 meatballs. Heat oil in large skillet over medium-high heat and cook meatballs, turning occasionally, until browned and cooked through, about 3 minutes. Serve with GUAVA SAUCE.